Late on the afternoon of Jan. 28, 2014, all the ever-changing variables in the workday of Jose Dario Suarez turned against him. That day, his third on the jobsite, the 55-year-old ironworker stood in a boom-lift bucket, holding a cutting torch fueled through a hose. Near him stood another veteran ironworker, Terry Watson, who operated the controls. The boom lift sat on a small barge at a new pedestrian bridge being built over Brazos Lake, part of the Brazos River, on the Baylor University campus in Waco, Texas. Watson was preoccupied with getting the bucket in the right position near a recently placed beam. Suddenly, Suarez, Watson and the boom lift tumbled off the barge into frigid waters. Tied off to the basket as well as wearing a floatation vest, Watson managed to surface, purple-faced. In his haste, he first swam in the wrong direction—away from the barge and toward a bridge pillar—before swimming back to the barge. After 108 heart-stopping seconds in the water, the crew pulled out Watson. Suarez, also tied off and wearing a vest, never surfaced. A forensic medical examiner’s report showed that he managed to undo one of his fall-arrest harness buckles before his lungs filled with water and he lost consciousness. Two years later, the details on what should have happened to prevent Suarez’ drowning that afternoon are before a jury in Harris County state court in Houston. The jury will decide claims for negligence and damages by Suarez’s family—his wife, Raquel, his three children and his mother. They have sued most of the companies involved. Suarez’ death is full of pointed reminders for construction employers, safety managers and workers about what can happen on a project run by a careful prime contractor team, with a record of good safety management, working with an experienced steel-erection subcontractor. Prior to the accident, the project team took pains on paper but missed numerous opportunities, involving the protective equipment, the barge placement, the boom lift and its operator’s experience, that could have prevented the accident, according to a review of legal pleadings, witness depositions and the federal investigation into the accident. Safety concerns expressed in writing before the accident were undermined by human oversight and lapses in the field, the documents show. There are other important ideas involved. For years, ironworkers have chafed at 100% tie-off, fearing a greater hazard from being constricted in an unpredictable environment. What happened at the Baylor bridge that day, when both Suarez and Watson were tied off, amplifies that concern and evokes another: that safety isn’t a binary matter of being tied off or not, safe or unsafe. At any moment on any project, all workers’ safety involves variables that comprise changing conditions and human nature. When enough of the variables line up the wrong way, as they did on Jan. 28, 2014, someone can get hurt or die. What triggers similar low-frequency, high-impact events is the focus of a current Construction Industry Institute study. John Gambatese, professor at Oregon State University and a member of the CII research team, says the study is developing a method to analyze precursor events. Some of the precursors at the Baylor jobsite—such as not taking 10 to 15 minutes to adjust the barge, vague safety procedures and employees who are new or unfamiliar with the working conditions—seem to match the kinds found in other high-impact events, he notes. The U.S. Occupational Safety and Health Administration long ago settled its only penalty in the accident—a $5,000 levy against Suarez’s direct employer, steel erector Derr & Isbell Construction LLC. OSHA said the company failed to provide a safe work environment at the jobsite. In filing the lawsuit for the Suarez family, Houston-based attorney Vuk Vujasinovic targeted any entity that had anything to do with the matter, including the prime contractor, Irving, Texas-based Austin Bridge & Road. The firm is understood to have a teaming agreement with Tulsa-based Flintco LLC. In their defense, Austin Bridge and Flintco have argued that the accident is covered by workers’ compensation insurance and that survivors aren’t entitled to further damages. Several aspects of what happened aren’t disputed. 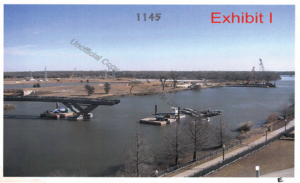 According to OSHA’s investigation report, Derr & Isbell had assembled a crew of eight at the pedestrian bridge, but none had ever worked over water before. Watson and Suarez had been on the jobsite just three days. Since Derr & Isbell crew supervisor David Nelson had turned away, no one other than Watson witnessed the boom lift in the moment before it went into the water. When he heard a scraping sound and turned back, Nelson saw the lift counterweight, but the lift was already in the water. Nelson testified that he was trained not to dive in to try to make a rescue. At the heart of the matter, expert testimony will claim that Watson, Suarez’s co-worker in the boom-lift basket, accidentally drove it off the modular barge—a claim supported by a police report. Watson has been extensively interviewed for pre-trial depositions. He clearly stated that, at the time of the accident, he had never previously worked on a barge or over water and that he had failed to read the boom-lift operating manual. He also was clear that Suarez himself had chocked the tires of the boom lift before getting into the basket with Watson and that the front tires were about 4 ft from the edge of the barge. Also, Watson was clear that his decision not to reposition the barge to avoid putting the boom lift at the edge was not due to rushing, but because they were in the middle of a task. “I wanted to just move … the lift and get it right.” Repositioning and re-spudding the barge would have taken 10 to 15 minutes. But parts of Watson’s account lack the incontestable clarity of some of his other statements. Part of a 4-hour-plus session held on Oct. 7, 2014, at an attorney’s Dallas office, his most interesting statements have to do with the moments before the accident when the boom lift is near the edge of the barge. In Watson’s account, when he and Suarez were both in the bucket, Suarez started to pull in a cutting-torch hose, preparing to cut a brace on the bridge section. Watson affirmed what he had told OSHA investigators that there were three knobs on the boom lift’s control panel: one for driving, one in the center for scoping or adjusting the position of the basket and the other for raising or lowering the boom. Just prior to the accident, stated Watson, his right hand was on the “scope-out control.” That part is clear. As Watson went to adjust the position of the boom and bucket at the bridge section, “scoping out” the exact position needed, “we were over the water as soon as we swung,” he said. When “scoping out, it’s a smooth scope-out, nothing moving. And then, all of a sudden, everything went to moving,” and “the next thing I knew, we’re in the water,” the ironworker added. Asked with almost theatrical intensity by Vujasinovic why Watson didn’t ask the barge and tugboat crews to reposition the barge, Watson stated that, at the time, he had asked them to move it for a prior task. But for the work and position needed at the time of the accident, “it just didn’t occur to me. I didn’t think I needed it,” he said. Whether or not Watson accidentally drove the equipment off the barge, missed opportunities stand out that could have prevented the accident. These include the failure to follow recommendations by the maker of the boom lift to secure the machine to the barge with chains. In another deposition, Derr & Isbell supervisor Nelson stated that he had tested the boom-lift chains for their future use on the barges. However, both Nelson and Watson stated that, at the time of the accident, the boom lift was unchained. Another missed opportunity involved the fall protection harnesses and tie-offs. While Austin Bridge & Road’s safety policy for working over water on a boom lift on a barge required employees to “wear [a] life vest or buoyant work vest in lieu of conventional fall protection due to the possible drowning hazard,” Flintco’s policy apparently was 100% tie-off, and that’s what was followed. Anthony Garcia, project safety manager for Austin Bridge & Road, stated in a deposition that Flintco’s Steve Jordan, whom documents identify as a safety manager, directed him to enforce 100% tie-off for work on the barges. “His opinion was 100% tie-off on an aerial lift,” Garcia testified. Derr & Isbell’s policy called for both tie-off and buoyant vests—for a good reason, according to Nelson. Of course, that also meant a fall into the water could be deadly because the boom lift would go to the bottom and so would the ironworkers. The court record shows no direct reply by Flintco’s Jordan. 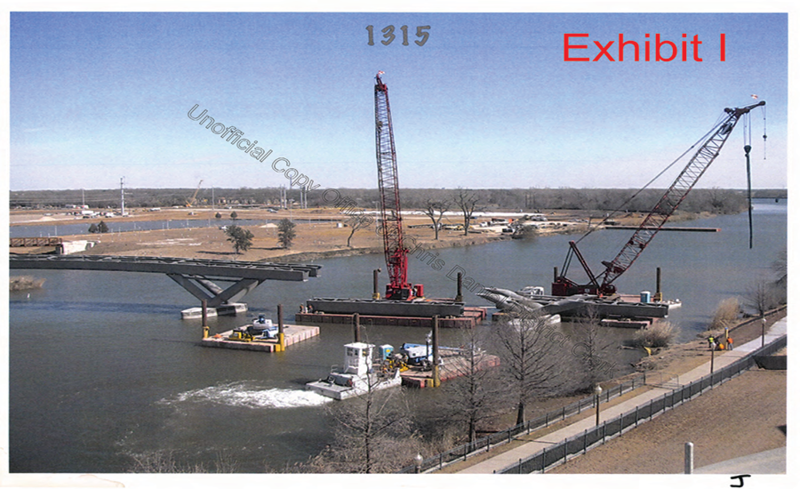 However, in the summer before the accident, when the bridge work was getting started, Jordan sent an email to Austin Bridge & Road’s Garcia, stating his concern about what he had seen of the bridge-work safety plan so far. The work was “high on [Austin-Flintco’s] and Baylor’s radar,” said Jordan. Five months later, his concerns proved to be well founded. Avoid accidents - look reliable and secure cranes in our shop.